Branded Arts is excited to announce its latest project, the Robert F. Kennedy Mural Festival. 28 artists have been commissioned to paint a series of murals throughout the Robert F. Kennedy Community Schools during a one­-week span from May 23­-27, 2016. In a desire to promote arts in school, these projects also aim to send an inspirational and positive message to kids ranging from kindergarten to the 12th grade. Not only will murals be painted throughout the week, but the Paul Schrade Library will be transformed into a gallery exhibition space featuring work from over 30 artists, as well as artwork from the students. This project was born out of a collaboration with LAUSD local district central staff under the guidance of superintendent Robert Antonio Martinez. 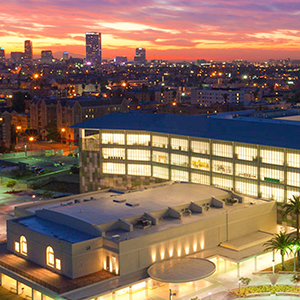 Built on the site of the former Ambassador Hotel, RFK Community Schools honors its historical significance as the site of not only six autonomous pilot schools, but also as the site of the 1968 assassination of Robert F. Kennedy. To honor the US Senator and his legacy, the school adopted his namesake and commissioned two Judith Baca murals in addition to preserving the original architecture of the Cocoanut Grove Theater. The school was built as a modern interpretation of the original Ambassador Hotel, maintaining elements of the original structure and celebrating its star­studded yet somber history. Local history, art, and education have come together to create a space of diversity, creativity, innovation, and social justice ­ all social elements that RFK Community Schools seeks to foster. Branded Arts is a Los Angeles based organization that offers a full spectrum of artistic services for communities and corporate settings alike. Over the last 5 years they have produced over 150 public and private mural projects around the world, most recently at The Reserve LA, a 20­acre creative campus in Playa Vista, California. RFK Community Schools is comprised of six autonomous Pilot schools offering a Kinder through 12th­grade campus on the site of the former Ambassador Hotel, the site of the 1968 assassination of Senator Robert F. Kennedy. The school was built to relieve underperforming and overcrowded schools located in Pico Union and Koreatown, and now serves over 4000 students from schools that include the Ambassador School of Global Education, Ambassador School of Global Leadership, NOW Academy, UCLACS, School for the Visual Arts and Humanities, and Los Angeles High School of the Arts.